Can you give me an example of what it shows now? Also what does it show on other clients (if your using any other and if not that is fine too, just trying to compare)? Edited by gcw07, 24 December 2013 - 04:00 AM. I have more info, but I also have to make an admission. But first, a question: re getting to the details page. Am I supposed to do this from the Roku? Because I could not find anything that said "Details". It may not matter however. Apparently I got so frustrated when trying to select an audio track and subs, I constructed a false memory of the track languages displaying in VLC. I checked that movie this morning, and the languages do not display there either. It must have been some issue with Handbrake. The movie was the Blu-ray edition of Elysium. What also threw me off is that the first five minutes of so are in Spanish, regardless of which audio track is selected. Elysium (From BR): I can select different subs, but none actually display. Since the first few mins of the movie are in Spanish, I thought I could not select different audio tracks. Had I tried different chapters, I would have realized I actually had changed tracks. So not even English subs during the Spanish scenes. Captain America (From BR): Languages do show up as expected. I can switch between them. Subs do not display even though selected. Pans Labrynth (From DVD): Subs did display (the entire movie is in Spanish). I decided the reason the subs look crappy, is because they are crappy. rechecking in VLC revealed this. All of the films sourced from BR are mkv files. Perhaps that's why MB in the Roku won't display the subs? But I have not seen this mentioned anywhere. (I sometimes have a problem making mp4 files with Handbrake: often, if I add subs, Handbraks burns in the first one so it is always displayed, and I cannot select another track. This is with "Burn in" un-selected). Another issue: Argo (from DVD). Subs appear to display, but below the movie. The movie is widescreen (possibly anamorphic), and only the very top of the subs shows up, so they cannot be read. In other words, there are black bars top and bottom, with the bottom bar covering the subs. Only where the top of the subs overlap the movie image can you make them out. 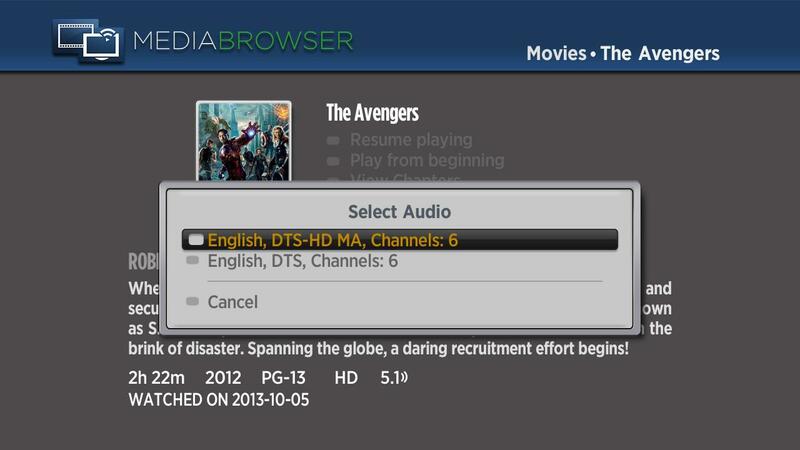 There does not appear to be any setting in MB Roku client to change how a movie is displayed. Yeah that is also where the details page is I was talking about above. Not in the Roku client, but the server's web client. Yeah curious if the subs for the same movie show up in the web client or not. Just so we can try to narrow it down and see if it is something needs to be changed with the subs stuff or if it is a problem directly with the Roku client. Our subs guy @Tikuf I believe is out of town for the holidays. So not sure if he will pop in and see this thread or not until after Christmas. Don't know how to take a screenshot on the Roku but when I play the video the subtitles options show "None" and "Blank". I have to select the blank line to have them show up. Edited by Wayne Luke, 24 December 2013 - 05:10 PM. By web client, do you mean open the Dashboard, go to Metadata Mgr., click "Movies at the top left, then click on a movie (I'm very new to this)? Doing that, and playing Elysium there, the subs do not display. Same with Jack Reacher. Does this make it a server issue? And should I repost this info elsewhere? They are not external subs. And only Elysium does not show which language a particular track is. Whether the name of the language shows up or not does not seem to make any difference, subs never display in MKV files sourced from Blu-rays, in both the web client and the Roku. See look at the subtitle on that one. "subrip, Default". It doesn't have the language specified, which is why the Roku doesn't know what to display. Are you using external subs or internal ones? Best way for a photo is probably just to take a picture with your phone. And I will attempt to do a BR to mp4 Handbrake conversion (if I can get it to not burn in the subs), and see if that displays the subs on my Roku. They are merged into the MKV container. My son wrote the scripts. I'll ask him if it is possible to specify the language and test more. Thought about the phone. Will try later when I can pry the television out of the hands of bored teens. That is if you still need it.